Welcome to Volume 3, Issue 2, another successful issue of the Australian Medical Student Journal. The current issue again provides our medical student and junior doctor readership with a broad range of intellectually intriguing topics. Our medical student authors have continued to submit quality articles, demonstrating their important contribution to research. Publication of medical student research is an important part of the transition from being a medical student to a junior academic clinician and the AMSJ continues to provide this opportunity for Australian medical students. Some key highlights from this issue include an editorial from our Associate Editor, Foong Yi Chao, who illustrates the important role that medical students have in clinical settngs – in addition to their role in medical research. Continuing this theme are submissions that describe an impressive Australian medical student-led project aimed at reducing the incidence of malaria in a Ugandan community as well as a student elective project in India. Other submissions range from an examination of the traditional white coat in clinical medicine, the history and evolution of abdominal aortic aneurysm repair surgery, case reports in paediatric surgery and infectious diseases, a student perspective in palliative care medicine and the future role of direct-to-consumer genetic tests. We also present a systematic review on “Predicting falls in the elderly” by Mina Sarofim, which has won the award for the best article for Volume 3, Issue 2. This research was identified by our editors and reviewers to be of a significantly high quality, with robust and rigorous methodology. Sarofim’s article analyses an important problem and cause of great morbidity in the elderly population. The Hon. Jillian Skinner MP, New South Wales Minister for Health and Minister for Medical Research provides us with an insightful discussion on the role of e-health and telemedicine programs in improving healthcare. Advances in e-health will be of significant value to the Australian community, especially in rural and regional areas where a lack of appropriate specialist care has been a major problem. The AMSJ continues to support initiatives to encourage student research. We are pleased to be publishing a supplementary online issue of research abstracts presented at the Australasian Student’s Surgical Conference (ASSC) in June this year. Another new addition to our website will be a database of all peer-reviewers who have contributed in 2012. We are always on the look out for new peer reviewers who are welcome to fill in their details via our website. The AMSJ Blog is another initiative that we are excited to have been redeveloping and revitalising. From November 2012, readers can look forward to regular fortnightly articles from the AMSJ staff. Topics coming up include conference summaries, tips on professional networking and even a discussion on the coffee habits of medical students! 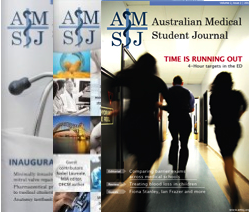 Since our inaugural issue in 2010, the AMSJ has continued to expand as a student publication. We received over 70 submissions for this issue and have been able to continue to publish approximately 30-50% of submissions. We have also recently completed a new Australia- wide recruitment for staff members. Our nation-wide based staff have continued to successfully work together through the use of teleconference meetings and email. The production of this journal is a major undertaking, with several staff members completing their final medical school exams during the process of compiling this issue. We would like to extend our thanks to all of our voluntary staff members as well as the invaluable assistance of our external peer- reviewers for donating their time and efforts in ensuring a successful issue of the AMSJ. In addition, we would like to thank you- our valued readers and authors for your continued support and providing the body of work that has made this publication possible. We hope that you will enjoy the current issue as much as we have in compiling it.